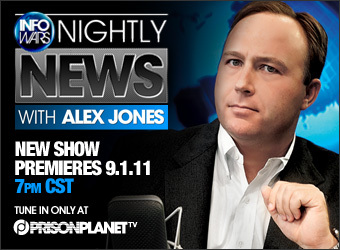 Thursday September 1st marks the exciting launch of Infowars Nightly News with Alex Jones, a brand new television show available exclusively to Prison Planet.tv subscribers. Don’t expect this to merely be an extension of the Alex Jones Radio Show. The new TV program will have a different format, different production, different guests and different hosts. This is an all-new 30 minute nightly infobomb of tightly condensed information, expert guest opinion and breaking news, as well as documentaries and other content that you won’t find anywhere else. As Prison Planet.tv members have seen from our recent special reports, the new TV show is a fresh addition to the Infowars offensive, featuring individual subjects covered in-depth, as well a standard news format coverage. Infowars Nightly News with Alex Jones premieres Thursday September 1st at 7PM CST. As well as the ability to watch the show at 7PM every night, Prison Planet.tv members will also have exclusive access to on-demand archives of the TV broadcast so they can watch where and when they want. There’s no better time to become a Prison Planet.tv subscriber – click here to sign up today and get access to every Alex Jones documentary in high-quality, daily audio and video archives of the Alex Jones radio show, live streaming, conferences, Alex Jones speaking engagements, special reports and much much more, as well as multimedia archives spanning back seven years. View the clips of our recent special reports below for a taste of what to expect when Infowars Nightly News premieres this Thursday. Re: I'm So EXCITED! Infowars Nightly News Almost Here! 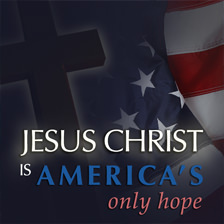 Glad to see there will be a nightly news program that's delivering truth. Finally! A nightly news source we can trust!!! News that people won't hear lies on--news we can rely on!! Wow, that is a KICKASS-LOOKING WEBSITE! LOVE THE RANTS, AND WEBM!!! In case you can't access http://infowarnews.com right now, http://prisonplanet.tv is up and working right now. They're still working on server load issues right now, it's been quite an overwhelming success from the looks of it!! The site is working great now. Must have been an issue at my end, methinks. Going in now - hopefully all is well at PPTV! truther22, I think you've got a great point. Don't get me wrong, it's about the message and the information, but perhaps adding a little spice to the delivery with a pair of ... well, you know ... wouldn't be such a bad idea. Not the whole broadcast (pun! ), but perhaps a portion and then... back to Alex the Great! It's not something I care for in a news program, but since the idea is to get the message out to the public as a whole, we must consider the lowest denominator. The regular pp.tv is running to slow for me, although it might be my connection. He could hire female reporters. Just download Orbit, run Grab++ before you enter the site, then play it, and a download link will come up in Grab++ to transfer your download. My link up there is time-delineated via a cookie, so you may or not be able to directly download that now. Did not get to hear it because of time difference. I get moving world scale distances a lot. I hope he will have replays. Not everybody lives in the same time zone. I hope the news cast will not be only US centered. Well, if you logged onto Prison Planet.TV where you would have be to see the show live... then, they played the show back to back for at least 3 hours afterwards... having said that, I assure you it is not US only... it aired World Wide on prison planet.tv for at least the 3 hours I had it on in the background... you can log on and watch it at any time however. "I am absolutely opposed to a national ID card. secrecy of government. We don't need a national ID card." Indeed, it was not U.S. centered, he had Web Tarpley on discussing world events as well as news from here in the states. All and all a real good job. Now I am looking forward to future shows. Make sure you check it out once you get your schedule adjusted you will not regret it. Re: I'm So EXCITED! Infowars Nightly News IS HERE! Show goes LIVE in 40 minutes! James Corbet is partnering with more organizations to bring exclusive interviews on his show, then there's Max Keiser's show now getting a Saturday edition for his 'Keiser Report show', and then finally there's this show being released that seems to be showing more potential with each episode building up to it. Hopefully Jesse Ventura's show (if everything works out) will be doing another season. It seems like some major battles are going to be won in the infowar!! We need 9/11 to be exposed to the world. This is the key to bringing it all down! This new show is another weapon in the infowar. I renewed my PrisonPlanet.tv membership just to see this new show. It sure is an exciting time to be awake/aware/alive! The show is very smooth tonight, great work and stories as well. But what then, after it comes down? What do we do? If it goes mainstream, the people will bring them down. By the way, great show tonight. Alex is interviewing Gary Franchi right now. Indeed, it's a great day to take down the global crime syndicate. The BPA exposure was fabulous!! I hope we can get this on YouTube so that I can pass this information to many people who use plastic for everything!! I would personally request for HD quality. I sure wish Alex was heard on the mainstream networks nightly. The set has the same professional designs as mainstream news broadcasts. The cutting edge set design rocks and Alex's delivery and presentation are second to none. Congrats and kudos.